. 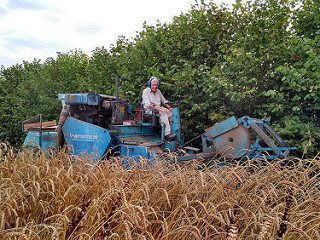 The afternoon started with a home-cooked lunch, followed by a tour of Martin Wolfe's inspirational agroforestry mature systems (including short rotation coppice for bioenergy, pollarded trees, fruit trees and timber trees), between the agroforestry rows Martin is trialling highly diverse cereal populations, better suited to changing climatic conditions. After the much- needed rain started to get a little less novel we headed back inside to hear from two growers who are just starting out on their agroforestry Journey. Mick Marsden from Gibside Community Farm and Jake Eldridge from Oxton Organics took us through their planning process and the lessons that they had learnt along the way. This provided a great introduction to the afternoons agroforestry design workshop led by Ian Knight from Abacus Agriculture. Ian talked the group through the design process from choosing your site to planting your trees, we then split into smaller groups to look at maps and plan our dream agroforestry systems.